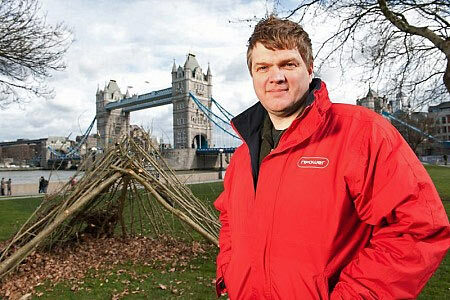 Welcome to the very first of our ‘Ray Mears Sightings’ blog posts. As a new venture of ours, the aim of these posts is to bring you the very best articles, interviews and videos of Ray Mears found online each month. Throughout this past month, Ray has been busy getting involved in a variety of projects that are occurring around the UK, as well as participating in interviews with a number of publications. To simplify things, we have rounded up the cream of the crop and hope that you will enjoy them as much as we have. Carlsberg recently launched their newest advertising campaign in preparation for the upcoming Euro 2012 football tournament in Poland and the Ukraine. Ray teamed up with other high-profile figures, including Des Lynam, Brian Blessed, Ian Wright and Stuart Pearce, to create an advert that put a massive smile on our faces, and that sees Ray teaching football fans how to endure the great British weather whilst supporting the national team. The Sidmouth Herald ran a great story on the advert which you can read here. Woodlore will be supporting the England team throughout the campaign in June, and want to wish Roy Hodgson and the team the very best of British luck! Ray has teamed up with the UK energy supplier npower in a search for Britain’s most passionate and creative environmentally-minded teenagers. The winners will get to take part in a once-in-a-lifetime masterclass with Ray, who will teach them various bushcraft and survival skills. Check out the official Climate Cops SOS 2012 page, where you can enter to win this fantastic prize. The hugely popular TNT Magazine conducted a great interview with Ray this month, discussing his involvement with the above Climate Cops SOS campaign, his survival skills, as well as which animal Ray is most respectful of. Read the full interview on the TNT website – Weekly Magazine, Travel Guides and London Life. Following up on the Climate Cops campaign, The Huffington Post produced a very insightful article into Ray’s involvement in the project, offering information on the skills session he held for teenagers in London recently, as well as some interesting statistics. Check out the article here. For information on Woodlore’s own children’s courses, please take a look at our range of Junior Bushcraft Courses. At the end of April, The Guardian featured an article on the world’s best walks, as suggested by a number of experts including Ray. Head over to the Guardian website to find out where in the world Ray prefers to go walking. This entry was posted in Ray Mears on May 21, 2012 by Woodlore Team.